1 photograph : b&w ; 19 x 23 in. 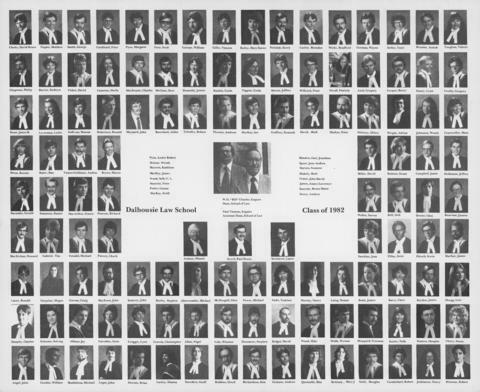 File contains a composite photograph of the Dalhousie Law School class of 1982. The photograph consists of portraits of John Angel; William Crosbie; Michael Maddalena; John Logan; Brian Downie; Dianna Lackey; Geoff Saunders; Lloyd Robbins; Kim Richardson; Andrew Graham; Rita Quesnelle; Mary J. McGinty; Douglas Sealy; Robert Camichael; Nancy Jenkinson; Robert Riteman; Charles Dunphy; Solveig Schuster; Jay Abbass; Anne Carrodus; Lynn Twigger; Christopher Correia; Nigel Allan; Winston Cole; Stephen Densmore; David Bulger; Mike Wood; Wyman Webb; Freeman Sheppard; Nola Keeler; Douglas Watters; Susan Cleary; Ronald Lacey; Megan Farquhar; Craig Garson; John MacEwen; John Doherty; Stephen Barley; Michael Abercrombie; Glen MacDougall; Michael Power; Toshimi Ando; Nancy Murray; Donna Laing; Janice Beals; Clare Barry; James Brydon; Lois Hoegg; Howard MacKichan; Tim Gabriel; Michael Feindel; Chuck Piercey; Dianne Pothier; Paul Burns Scovil; Lance Woolaver; Joan Dawkins; Srini Pillay; Irwin Hirsch; James MacKay; Gerald Barnable; Daniel Simmons; Ernest MacArthur; Richard Pearson; Steven Waller; Neil Bell; Glen Dexter; Joanne Bourinot; W. H. "Bill" Charles, Esquire (Dean, School of Law); Paul Thomas, Esquire (Assistant Dean, School of Law); Bonnie Moon; Dan Baker; Andras Vamos-Goldman; Shawn Brown; David Miller; Susan Bottern; Jamie Campbell; Jeffrey Hollaman; James K. Kean; Leslie Leverman; Shauna Sullivan; Donald Robertson; John Maynard; Aidan Beresford; Robert Lehodey; Andreas Thomas; Ian MacKay; Kenneth Godfrey; Mark David; Peter Markus; Hilary Whitney; Adrian Wright; Wendy Johnston; Mara Crassweller; Philip Chapman; Kathryn Racine; David Fisher; Sheila Cameron; Charles MacKenzie; Burt McCann; Jennie Donnelly; Linda Rankin; Linda Tippett; Jeffrey Morris; Peter Willcock; Patricia Nicoll; Gragory Auld; Bruce Cooper; Lynn Henry; Gregory Crosby; David Bruce Clarke; Matthew Napier; George Smith; Peter Coulthard; Margaret Pyne; Scott Gray; William Guinan; Vincent Gillis; Mary Karen Bailey; Kerry Harnish; Brendan Curley; Bradford Wicks; Wayne Gorman; Terri Deller; Joseph Rizzetto; and Valerie Vaughan arranged in several rows.